This part is designed to lock high strength axles in place, eliminating the unnecessary bulk of the VEX high strength clamping collar. Due to the slimmer profile, it allows for more compact designs and it utilizes the axle collar set screw. Before first use, it is recommended to screw in a 3/32 screw repeatedly to break in the threads. The diameter for this part is .75 inches, and the depth is .5 inches. This part was designed by Josef Spanbauer. This part was made to mount a 1.125 inch radial VEXPRO bearing (PN: 217-4270) onto VEX EDR metal. Due to its design, it fits within a three hole wide c-channel and the nuts utilized to secure this part to the metal lock the bearing in. 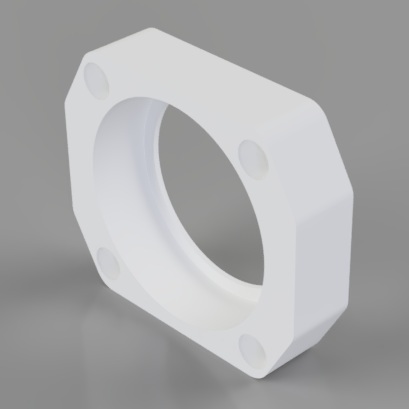 The small flange keeps the bearing level and prevents it from touching the mounting surface. In order to use axles with this part, VEXPRO bearing axle adapters can be used. The height for this piece is 1.295 inches, the width is 1.5 inches, and the depth is .355 inches. This part was designed by Josef Spanbauer. This piece was designed to elevate the robot for better access to the underside, making drive maintenance and building easier. Additionally, it allows for testing the drive for speed control, motor inverting , and sensor setup. This part elevates the robot just over 2 inches, but can be modified for varying heights. This part was designed by Josef Spanbauer.